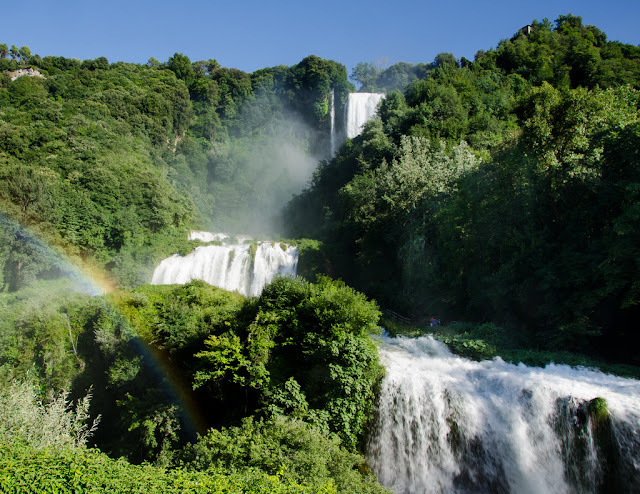 About eight kilometers of Terni, The Italian City has a magnificent three-tiered waterfall which is called Cascata delle Marmore. 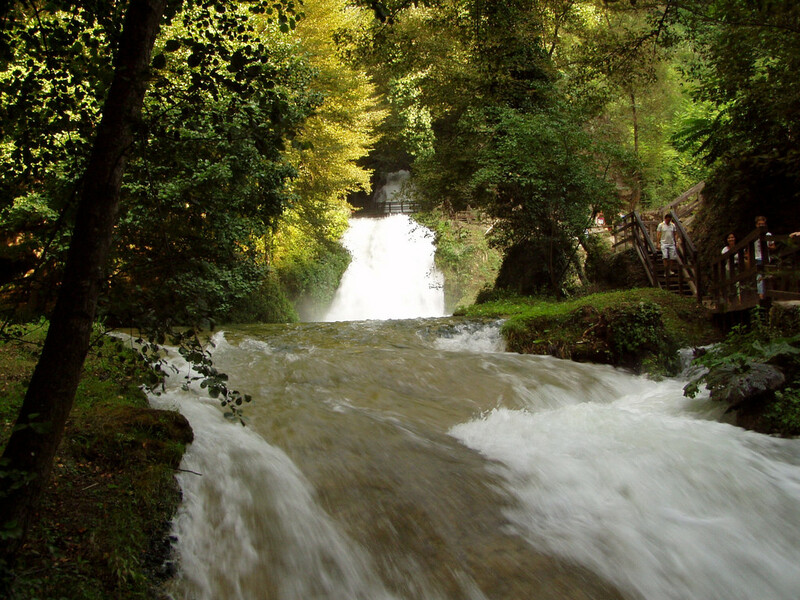 The tiered waterway, surrounded by trees and greenery, looks like a tremendous force of nature. 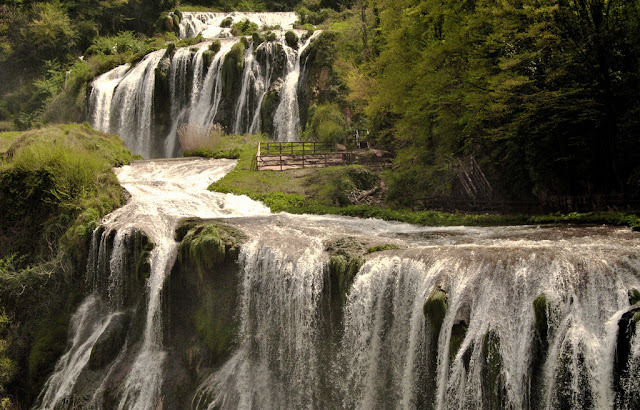 It is also recognized Marmore Falls were once part of Grand Tour of wealthy Englishman of 17th and 18th century. 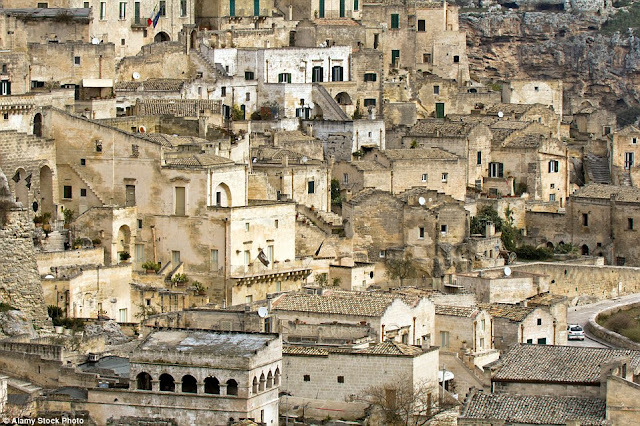 He went Italy and France to seeking out places art, culture, and roots of Western civilization. 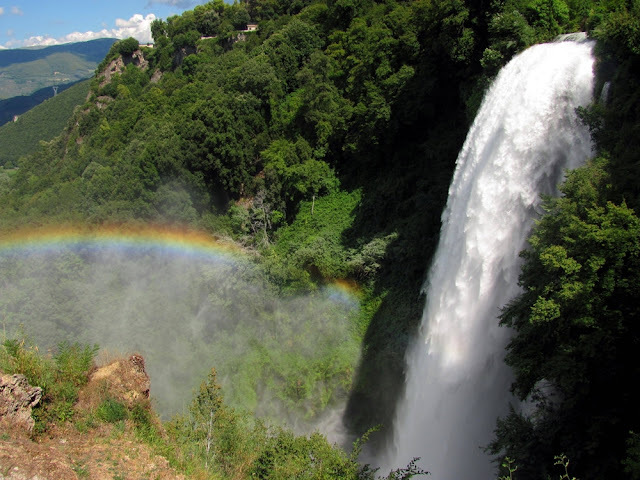 Cascata delle Marmore is a product of human engineering intervention with nature. The Cascata delle Marmore total height is 165 m making it the tallest man-made waterfall in the world. 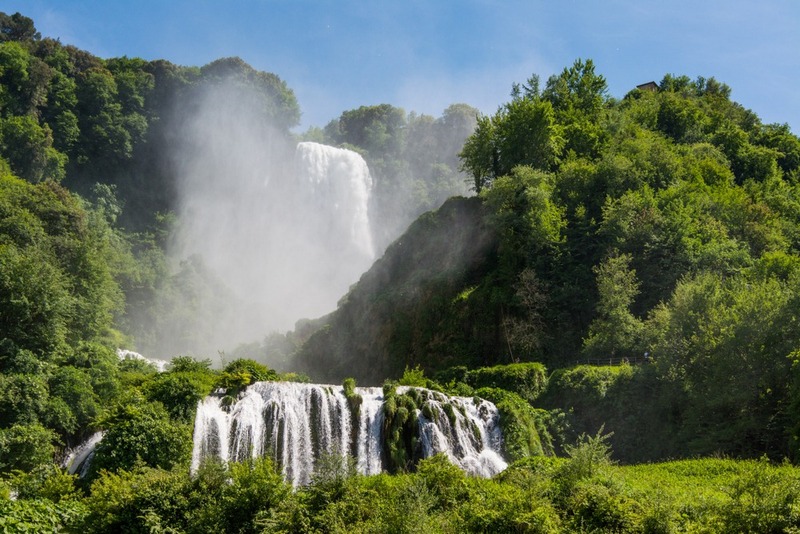 Marmore Falls’ curiosity lies not merely in its splendor but also in the fact as 2,200 years ago, no waterfall exists here. 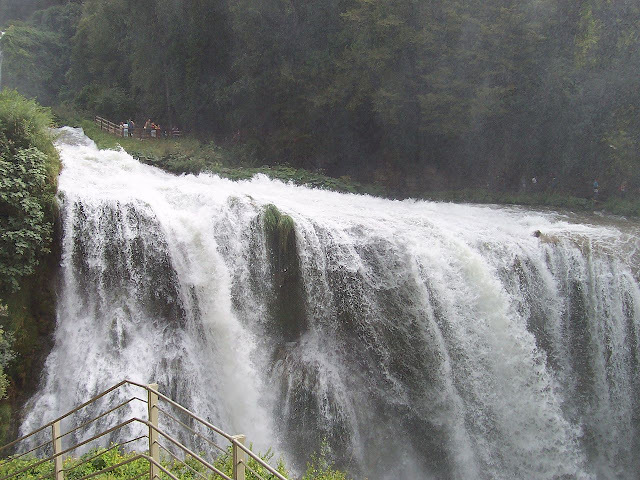 The Marmore Falls located at The River Velino, took a completely different path ending in a swamp within the plains of Reiti. The marshy and motionless waters of the swamp were believed unhealthy and were attributed for numerous illnesses that affected the population living there. 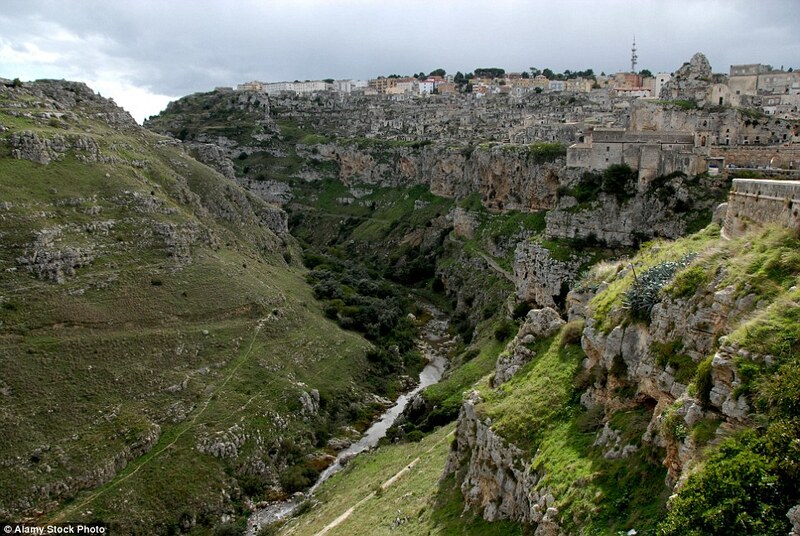 The Roman consul Manius Curius Dentatus gave a plan to construct a canal here. 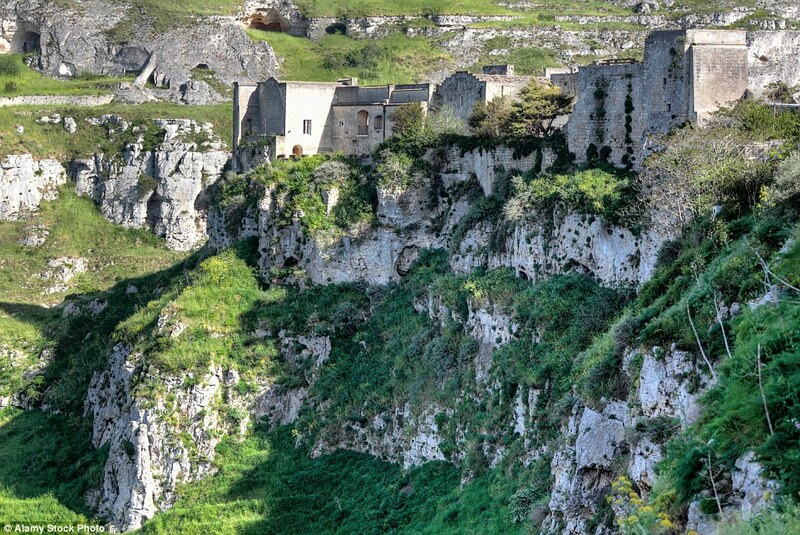 Later on, it was named Curiano Trench, in 271 BC, to drain the swamps and direct the excess waters into the natural cliff at Marmore creating the falls. From this point, the water fell into the Nera River below. Though, the solution didn’t work out as expected. The Reiti valley continued to flood, and when water was high in the Velino River, it now flooded the Terni valley too where the water was diverted. The man-made canal and the resulting flood became a long source of dispute between the inhabitants of Terni and Reiti valley. 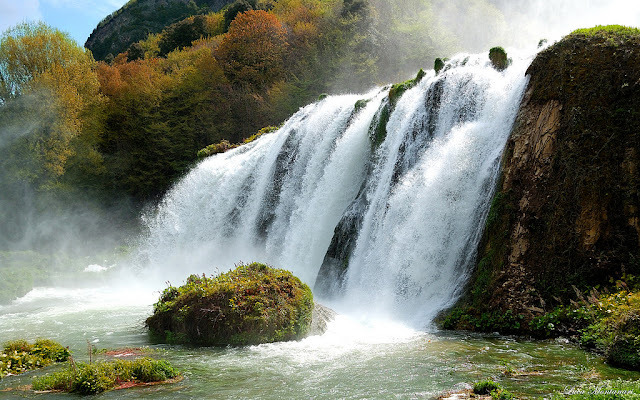 The former wanted the canal closed, whereas the latter sought the flow of the falls increased to accommodate the excess water. The problem between the two cities was so argumentative. So, the Roman Senate was forced to address it in 54 BC, but the agreement couldn’t arrive and the matter remains unsettled for many centuries. After the fall of the Roman Empire, the barbaric invasion and the development of the feudal system caused the planed territories and the countryside to be gradually abandoned. The lack of maintenance of the Curiano channel caused the base of the channel to accumulate silt and the Reiti valley once again began to flood. 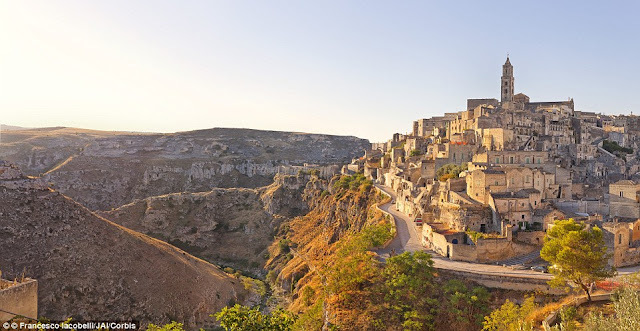 It was not until the 15th century that Pope Gregory XII ordered the construction of a new canal to restore the original flow. Further improvement was made by Pope Paul III in the mid-16th century and a regulating valve was installed to control the flow. 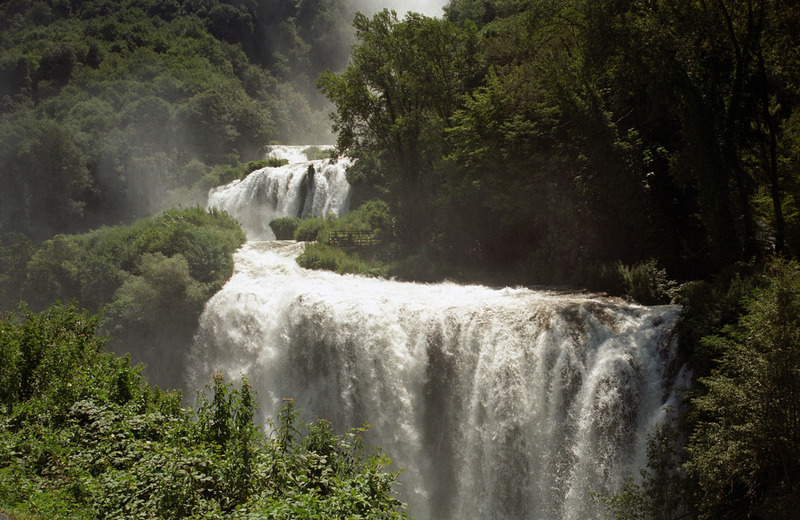 The final modifications were given the Cascata delle Marmore the present appearance. 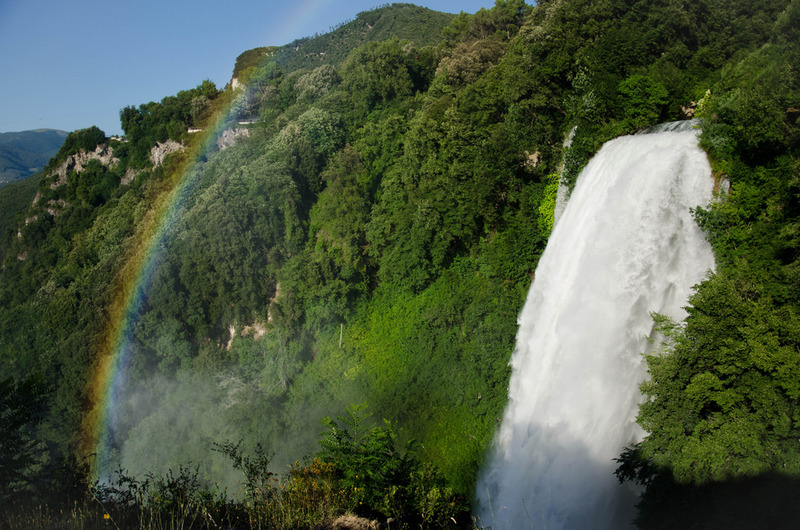 Cascata delle Marmore received its current look in 1787, when an architect Andrea Vici diverted some of the water to create a series of lateral cataracts on the instruction of Pope Pius V1. 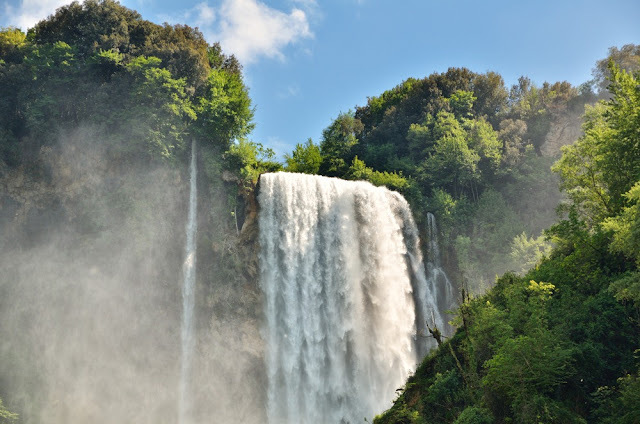 In 1896, the newly formed steel mills in Terni started to use the water flow in the Curiano Trench to power their operation to generate electricity. Tourists try to be there the moment the gates are opened to see the powerful rush of water. 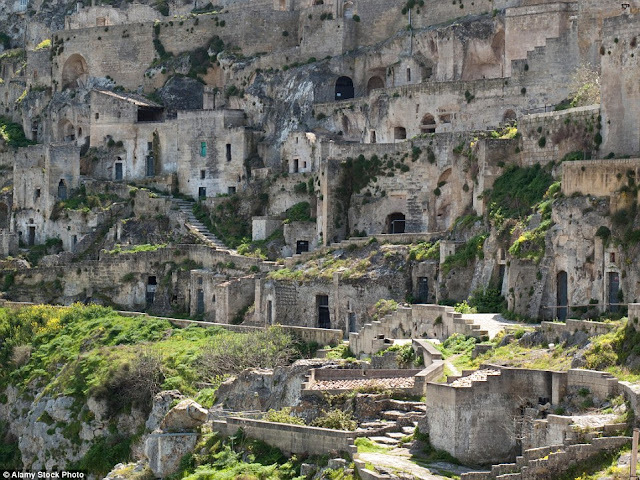 Twice a day, the power plant flips a switch and lets the water once again gush over the cliffs as it had for millennia. A beautiful path along the falls lets the visitor hike up to the top of the falls. Also, along the way, a tunnel leads to an observatory next to the falls, where a guest is guaranteed to get soaked. 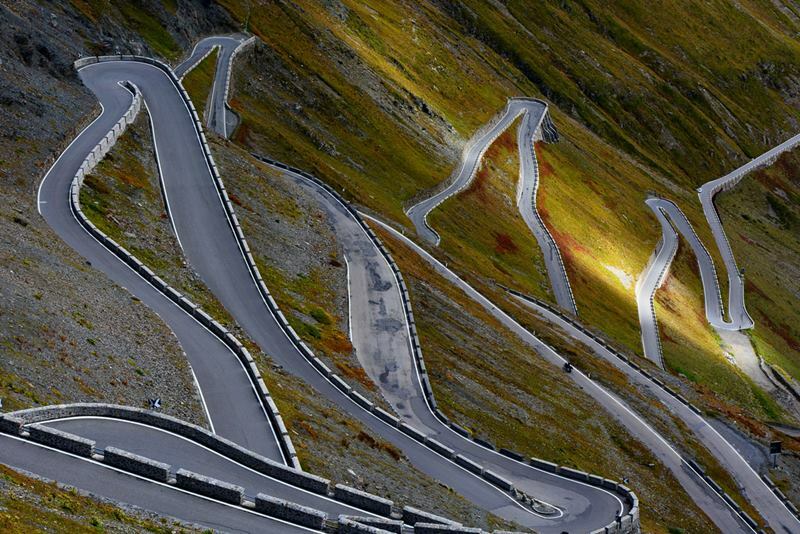 The Stelvio Pass is located in the Ortler Alps in Italy between Stilfs in South Tyrol and Bormio in the province of Sondrio, about 75 km from Bolzano and near 200 meters from the Swiss border. It is named for its proximity to the town of Stelvio, situated at 2757 meters above sea level and is one of those most amazing and spectacular places on Earth. The Stelvio Pass was actually built in 1820-1825 by the Austrians and has since changed very little. 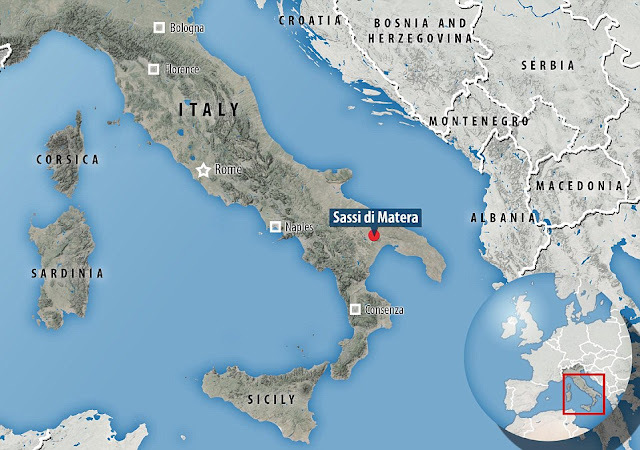 Due to its prime location between the Austrian, Swiss and Italian borders the passage was of great strategic position for years and was the scene of armed combat during the First World War. 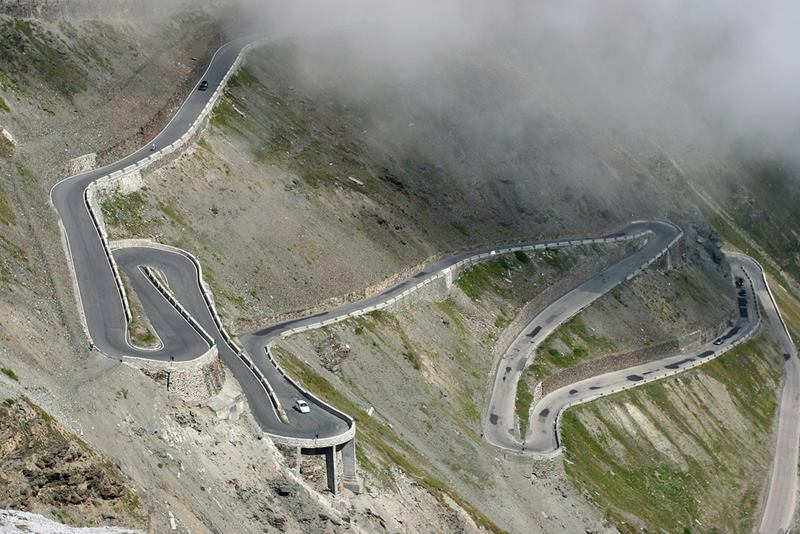 It’s one of the most wonderful road pass in Europe. 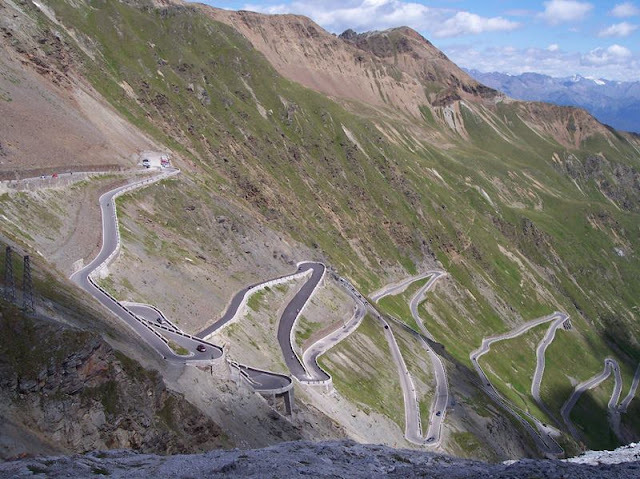 Although some accidents have already taken place in this high-altitude road, especially among people who underrate the difficulty involved in traversing its zigzag path. Thus, one after another, the 48 hairpin turns, extend over 24 kilometers away, with an average gradient of 7.5%. It is the highest paved mountain pass in the Eastern Alps and the second highest in the Alps, just 13 meters below the Col de l'Iseran, France. 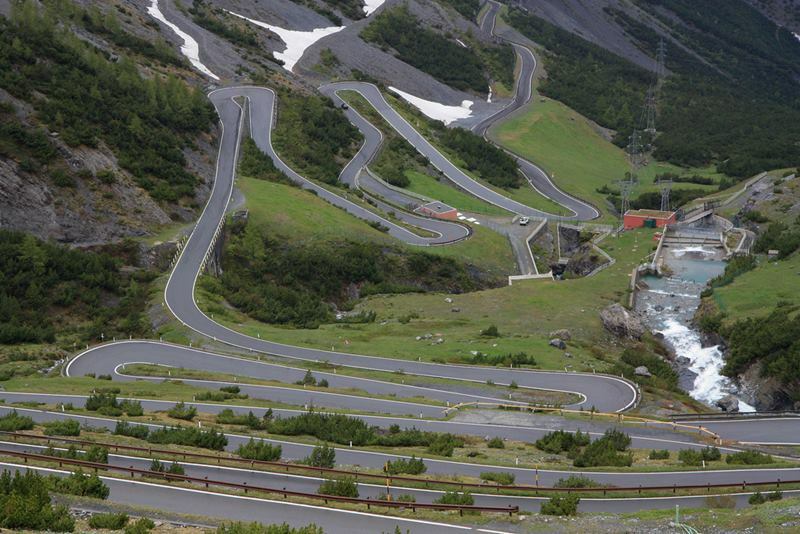 Therefore, it is an almost unreal scenario, the way to Davos, through Bormio, is remarkable and attractive without traffic. Hence careful exercise required for extreme caution when passing on-coming traffic, over-taking and around corners. 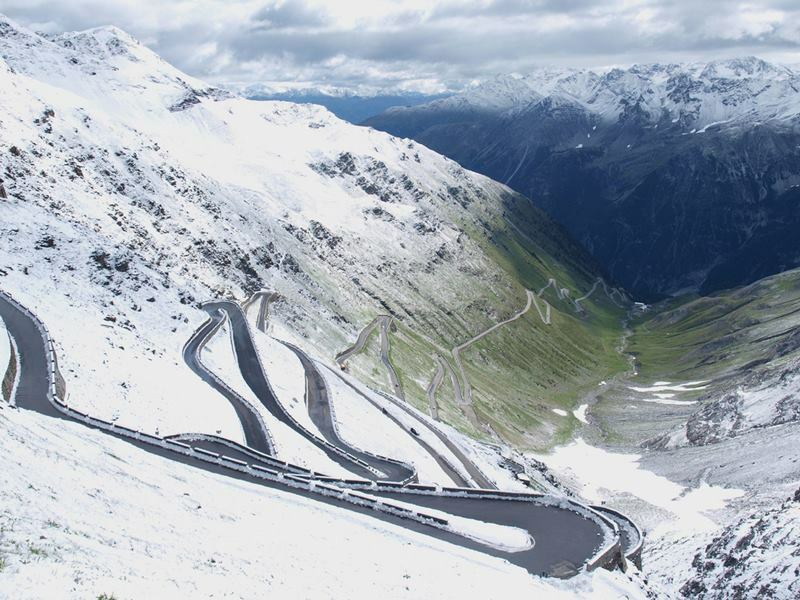 The Stelvio Pass is open from June to Sep, however, can be closed anytime, if high snow falls. 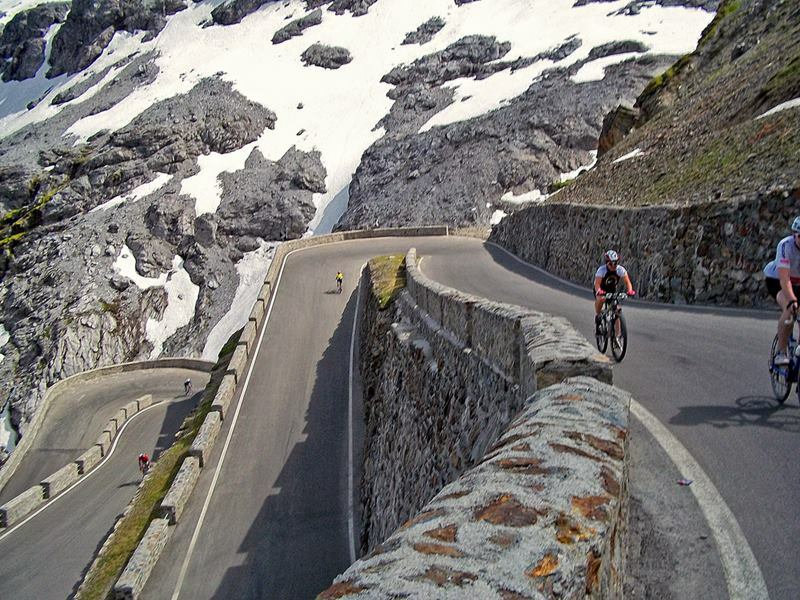 The Stelvio Pass retains an importance for sport lovers, it become a cyclist track, when Grand Tour of Giro d'Italia often crosses the Stelvio Pass, Every year, the pass is closed to motor vehicles on one day in late August when about 8,000 cyclists ride on the Stelvio. Moreover, the Stelvio Pass was also selected by the British automotive show Top Gear as its choice for the "greatest driving road in the world", though their search was concentrated only in Europe. The road over the pass, known as Stilfser Joch in German, toughest and most spectacular climbing is from the Prato side; Bormio side approach is more tame. Local drivers have been described as 'homicidal'. It's possibly the most historic of all climbs ever used in pro cycling, a giant in every sense. Indeed this road is very exhilarating and sometimes very exposed and unsecured driveway in innumerable twists and turns. The drive is definitely worth it. There are many excellent photo opportunities here. Don’t forget your camera! 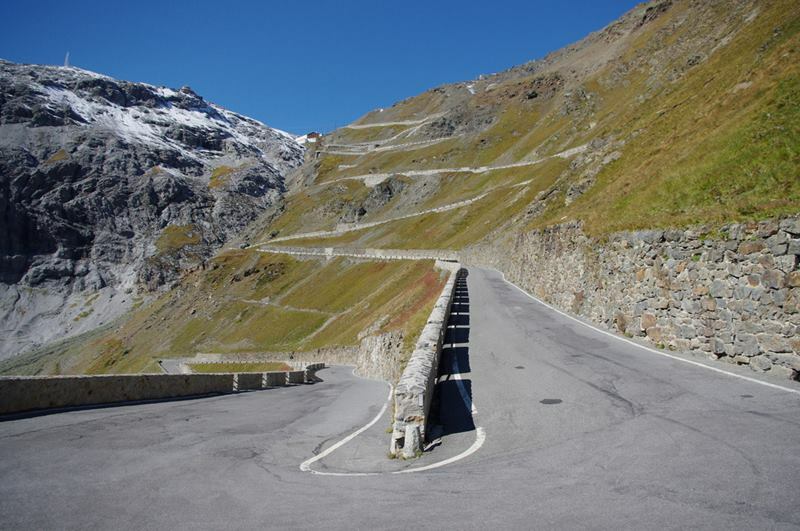 The Stelvio’s height can mean that it’s a wildly erratic and somewhat volatile mountain where the weather can turn in an instant, so be prepared. 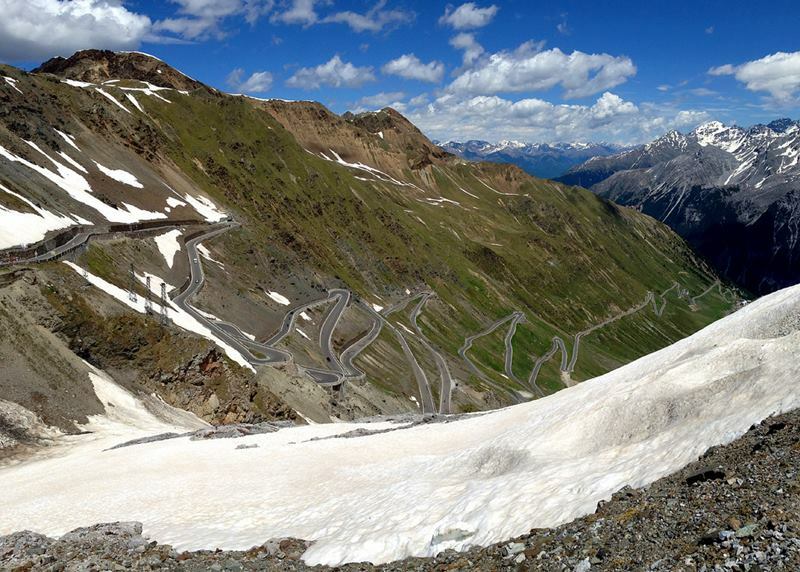 There’s little wonder why the Stelvio is one of the most snapped roads in the world. 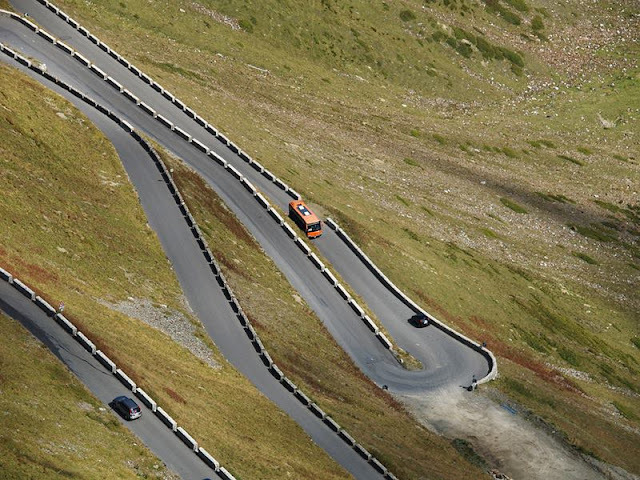 No less than 48 hairpin bends on its eastern face make it an icon like no other. 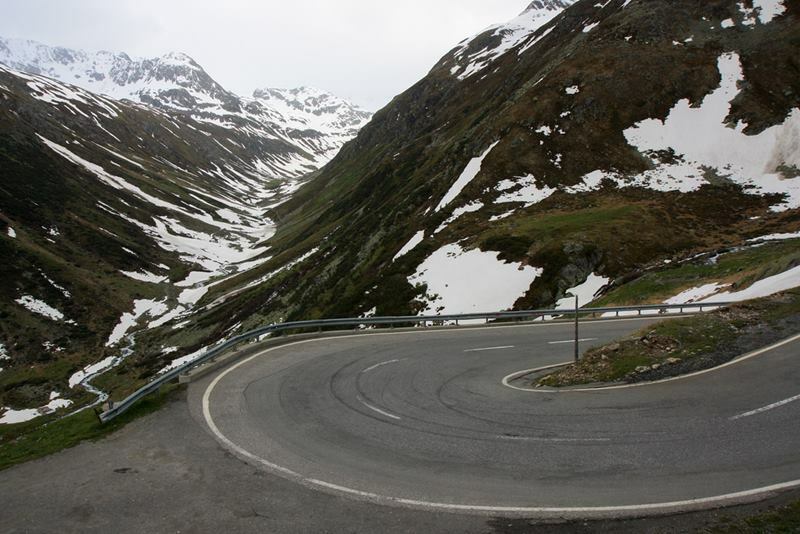 Hence, be careful that this is one of the last Alpine passes to open to traffic each year, and it’s not unidentified for the road to stay closed until July if there’s been a late fall of snow. 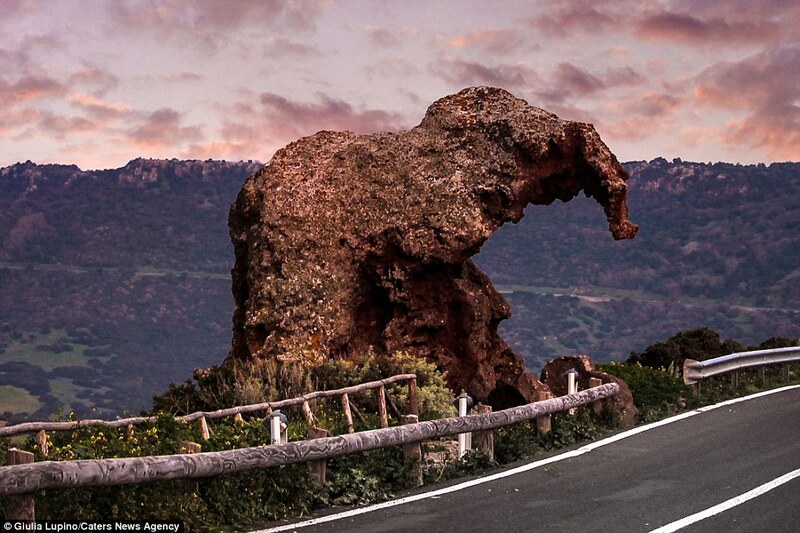 An unusual rock formation normally surprised drivers just like an elephant located Sardinia Italy. The Elephant Rock of Castelsardo describes as a “peculiarity” due to its resemblance with trunked animal. 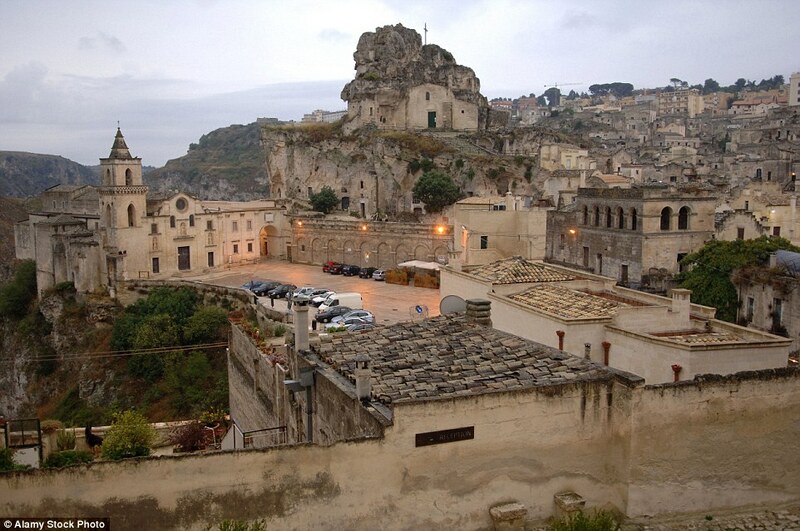 The below pictures were taken by a student Giulia Lupino. 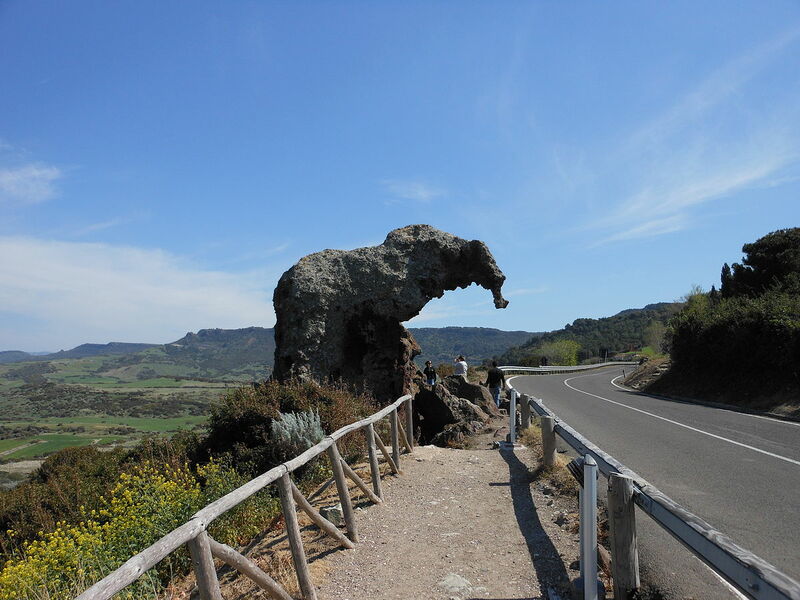 She is curious about Elephant rock from several years, but finally she traveled down to State Road 134 to capture photographs of the Rock. 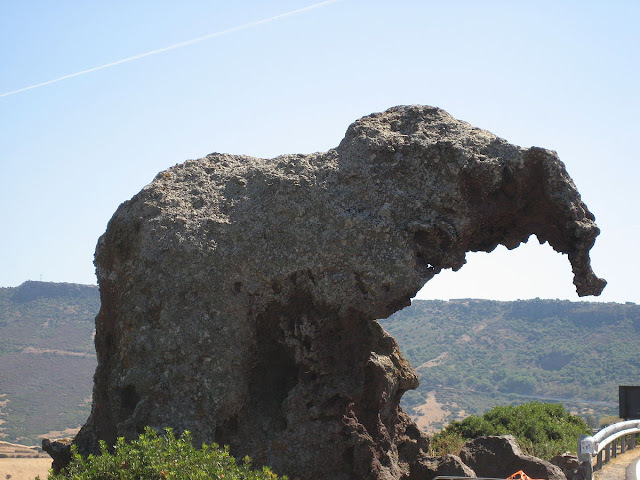 The Elephant Rock was known with the name Sa Pedra pertunta that signifies perforated stone. 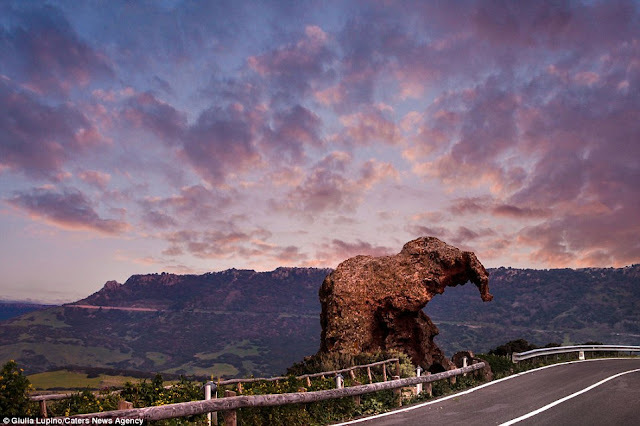 The massive mass of trachyte stone is thought to have been part of rocky complex of Monte Casteddazzu, but as the time passes, it broke away and rolled down the valley to its present location on the trunk road. Geologists believe, erosion led to the unusual appearance being formed with the perforated boulder bearing what looks like a trunk. 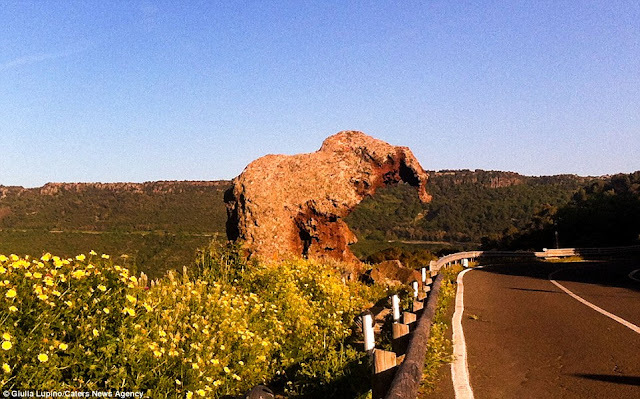 Therefore, it is not the only natural formation to resemble with large creature. The young (19 years) photographer said, the bizarre rock has the form of an elephant about four meters high looks incredible to see from each side. The true sculptors of rock initially thought a small one, but actually it is massive in fact. 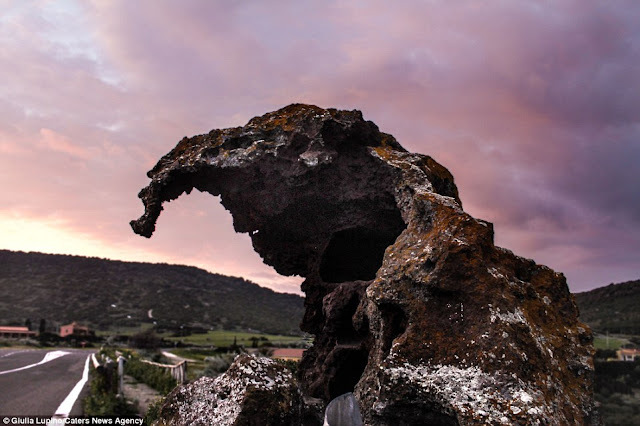 Moreover not only does the rock add to the natural beauty of the area but it also has archaeological impact as it contains two 'Domus de Janas' - a type of chamber tomb found in Sardinia. 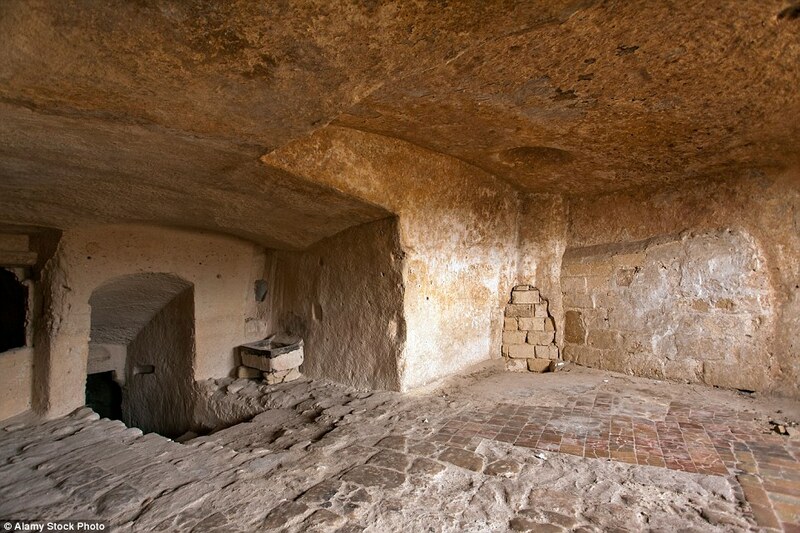 Moreover, the walls of the frequent erratically shaped chambers have relief decorations, cow horns and bull heads on a low base formed in the rock. A similar type of Rock Formation is located on the island of Heimaey in Southern Iceland; a basalt rock on the ocean side cliffs bears a weird resemblance to enormous elephant complete with wrinkled skin reaching its trunk into the sea. This rock is believed to form by volcanoes, rising out water. 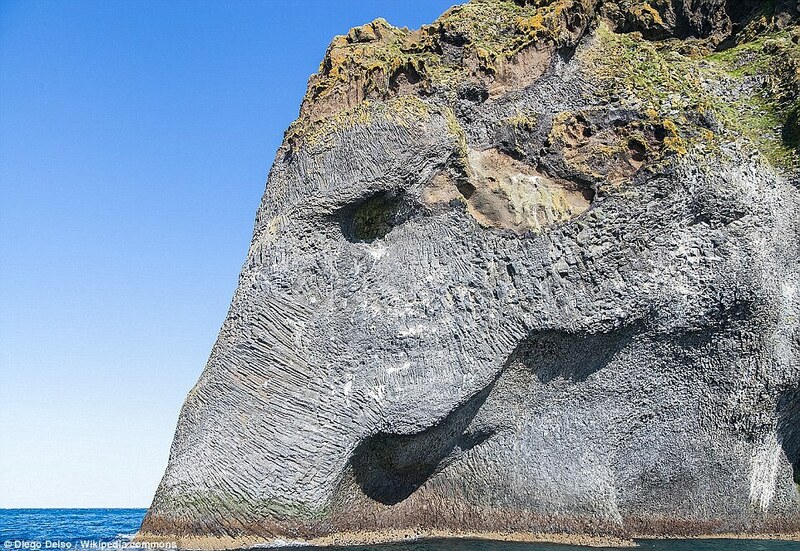 The elephant rock of Iceland can be found on the largest island in the Vestmannaeyiar, one of most widespread tourist attractions in summer months. Timelapse film produced in Rome, Italy from 12/31/2014 to 01/04/2015. More than 17.250 RAW-Pictures were taken with the Canon EOS 5D MK II and MK III with the Canon EOS 24-70mm 2,8, Canon EOS 24-70mm 2,8 II, Samyang 14mm and Canon EOS 70-200mm 2,8 II. Postproduction with Adobe Lightroom and LR Timelapse. Music by krizmental / homecookin.de. Produced in Spring 2015. Roma, Italia - 4K Rome Timelapse from 3motion on Vimeo. 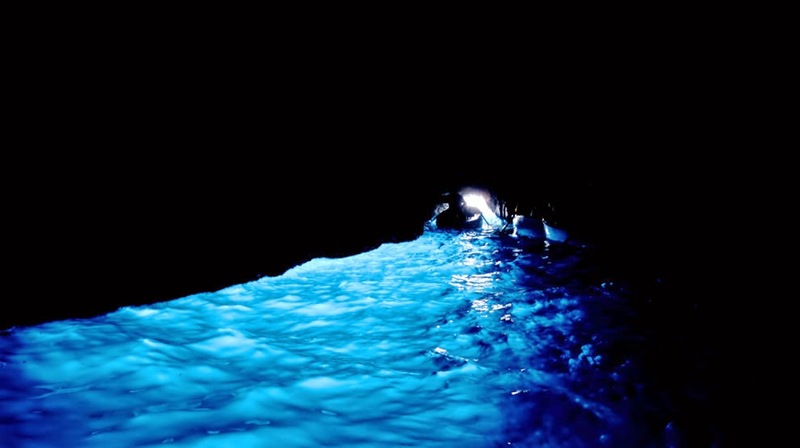 The Blue Grotto is one of few sea caves, worldwide, that is flooded with a vivid blue or emerald light. 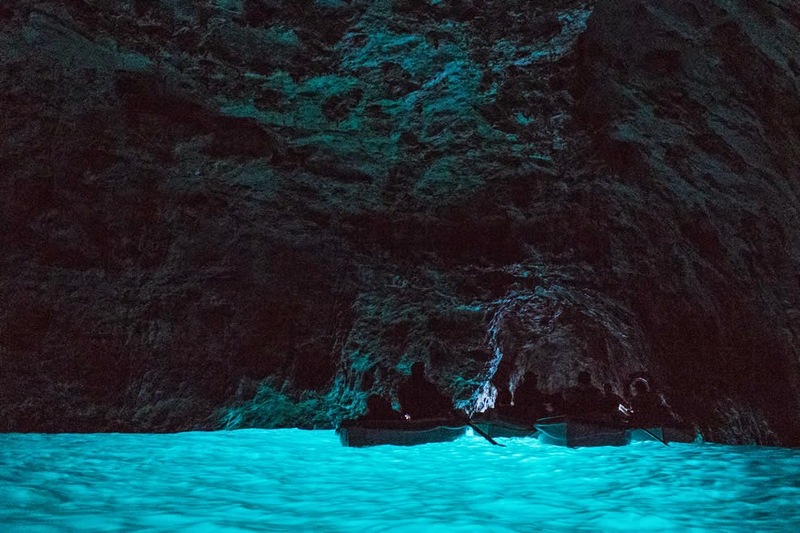 The quality and nature of the color in each cave is determined by the specific lighting conditions in that particular cave. 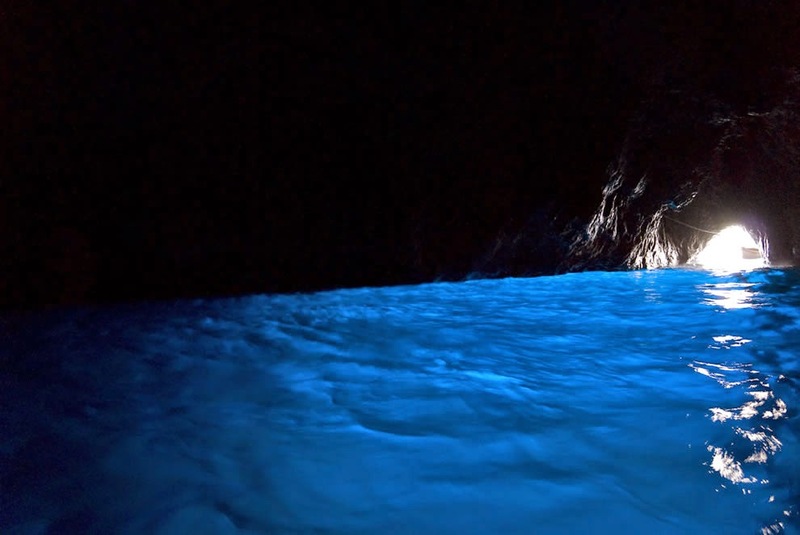 So, you must be bewitched by the unearthly exquisiteness and glowing blue waters in the Blue Grotto sea cave, scoured the web looking for more. 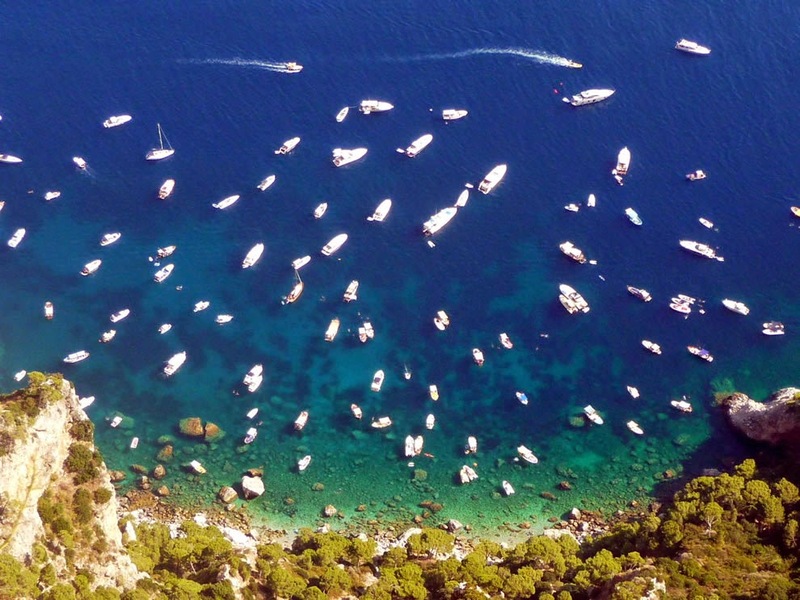 So, you could be find a favorite spot of a Roman emperor, has inspired artists for several centuries, and has become a massive tourist attraction on the Isle of Capri. 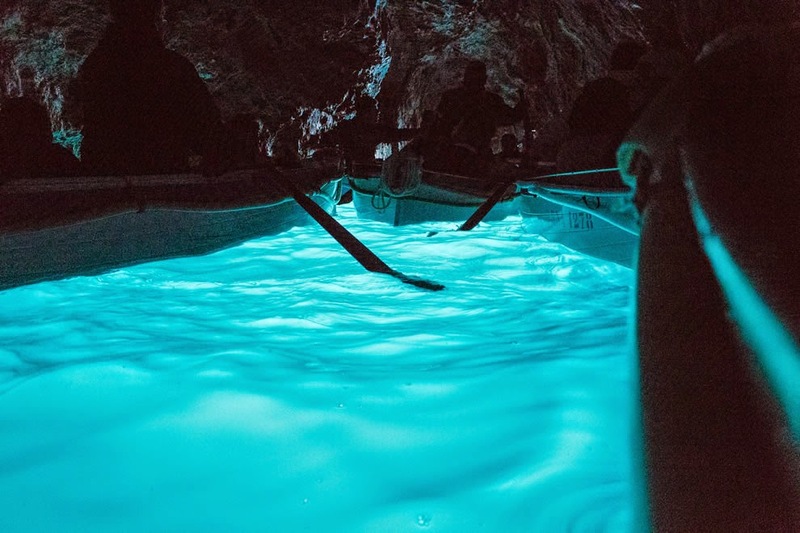 In Blue Grotto, the light comes from two sources; one is a small hole exist in the cave wall, exactly at the waterline, that is a meter and half in diameter. 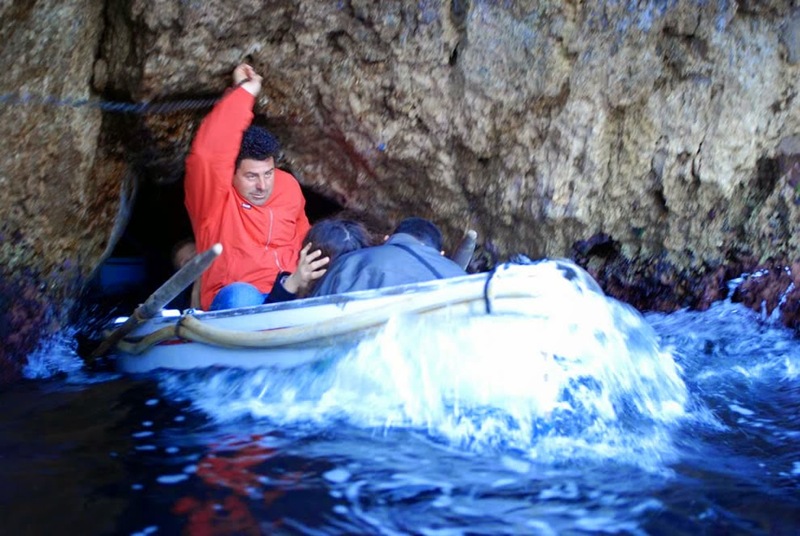 This hole is hardly big enough to admit a tiny rowboat, and normally used as the entranceway. 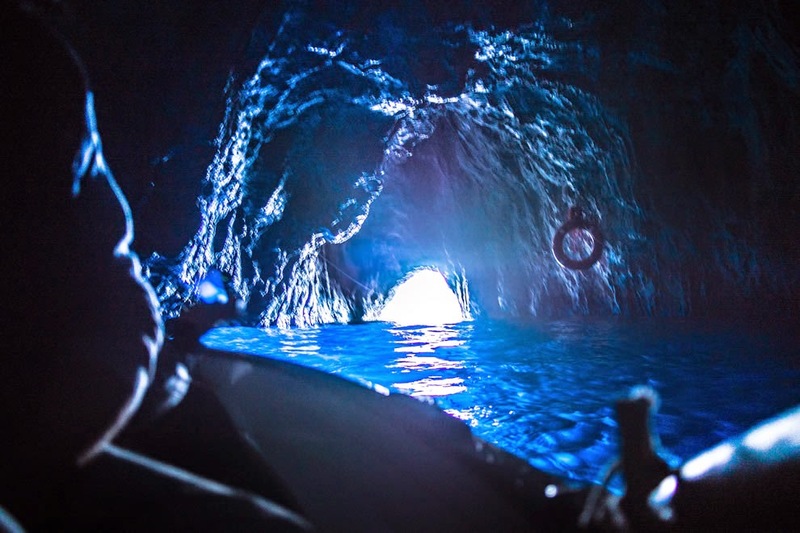 In photos taken from within the cave, the above water half of this hole seems as a spot of dazzling white light. 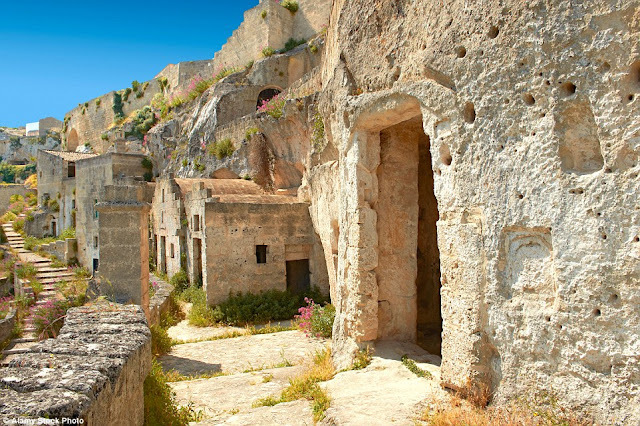 The other source of light is a second hole, with a surface area about 10 times as large as the first, which lies right below the entranceway, separated from it by a bar of rock between one and two meters thick. However much less light, per square meter, is able to enter through the lower opening, but its large size ensures that it is the primary source of light. 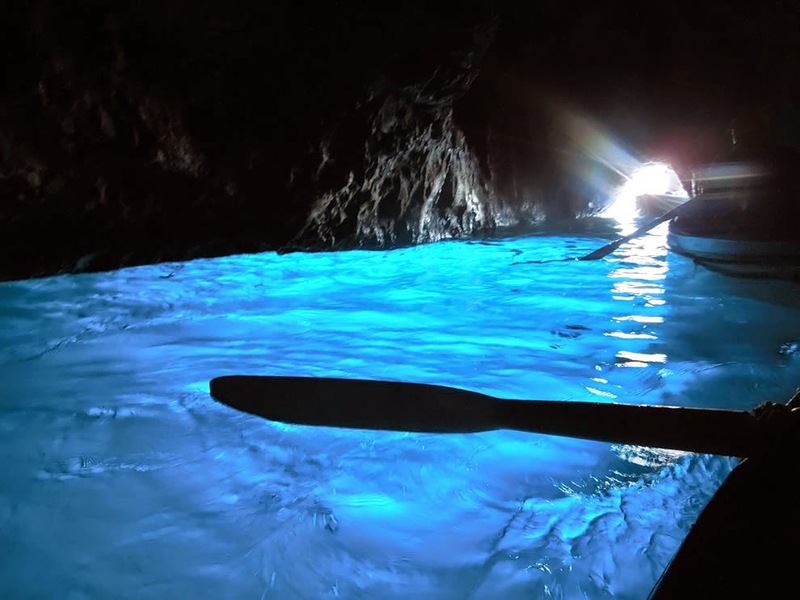 The stunning effect of the light from the above-water opening, it is difficult for a tourist who is in one of the row-boats to identify the shape of the larger hole, the outline of the bar that separates the two holes, or even the nature of the light-source, other than a general alertness that the light is coming up from underneath, and that the water in the cave is more light-filled than the air. 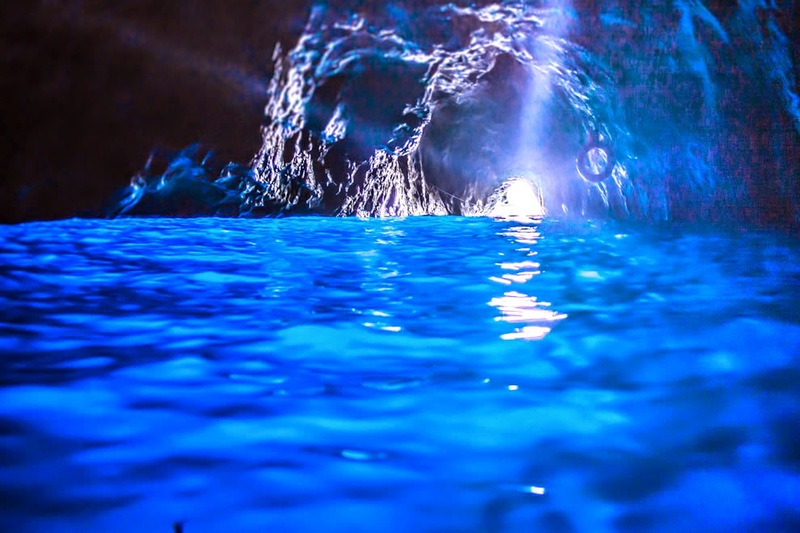 Therefore in rough seas and at high tide, the famous sea cave is not accessible; it has also been closed to tourists in the past due to water pollution in the form of raw sewage. 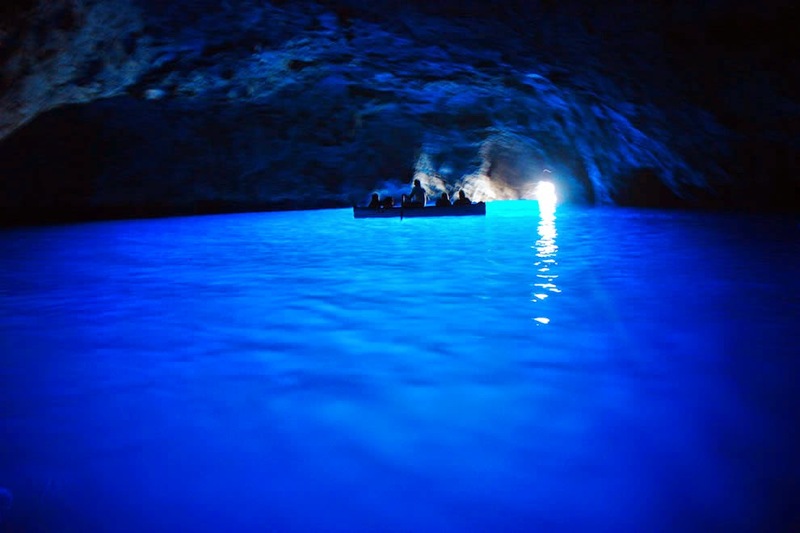 It is not the only sea cave in the Island of Capri and it’s not the only blue grotto in the world, but it’s absolutely the most famous. 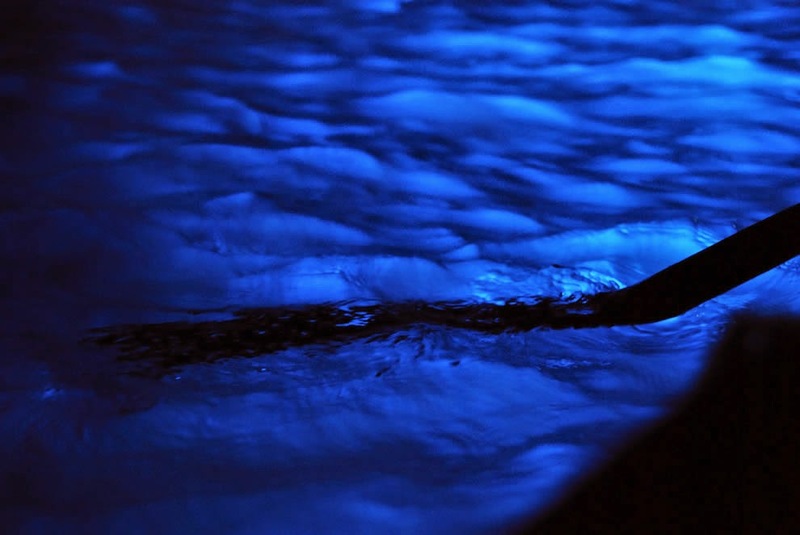 A tourist who places a hand in the water can see it "glow" eerily in this light. 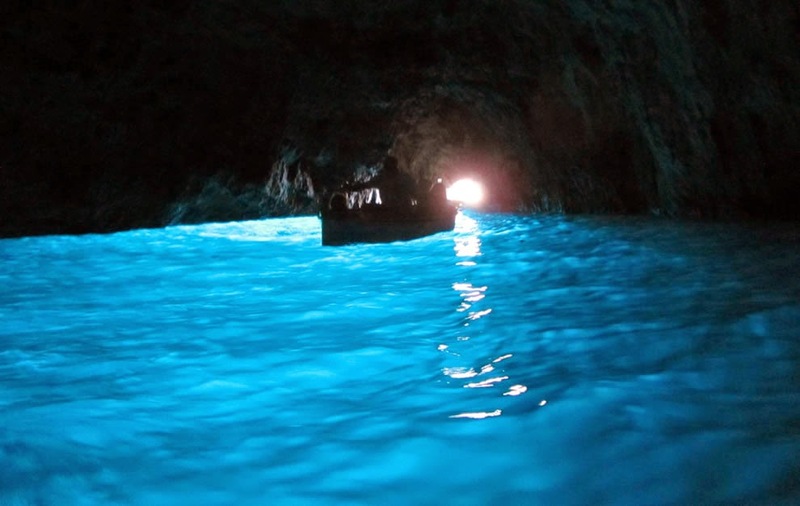 The grotto was famous by the Romans, and apparently used by the Emperor Tiberius during the years when he retired to Capri. Roman Emperor sculptures of the appropriate period showing Neptune and tritons have been recovered from the cave and it is thought more might lie on the deep bottom. Further, the discovery of remains of an ancient landing place and the work on an underground tunnel, form an image of a natural cavern adorned by statues. 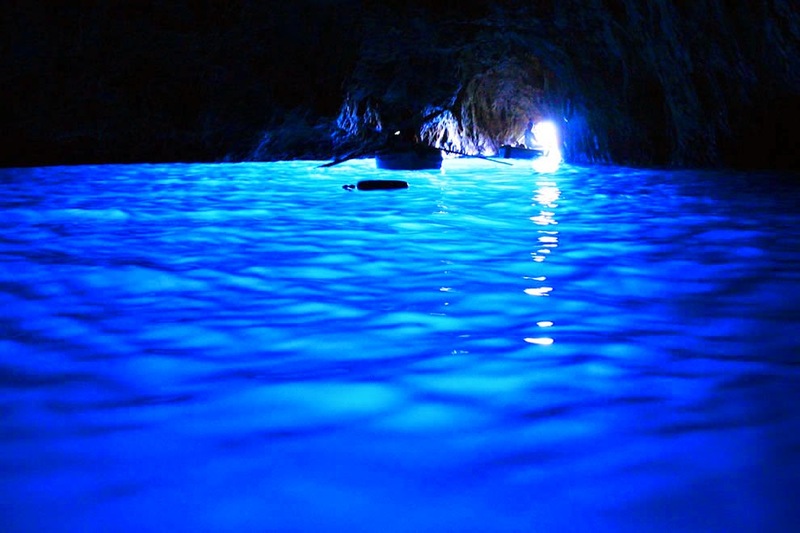 The grotto has appears in many books, and highlighted in the 1953 Newbery Honor book, Red Sails to Capri, by Ann Weil. In Alberto Moravia's 1954 novel Contempt “Il disprezzo”, visions of the hero appear when he decides to pay a final visit to the cave. 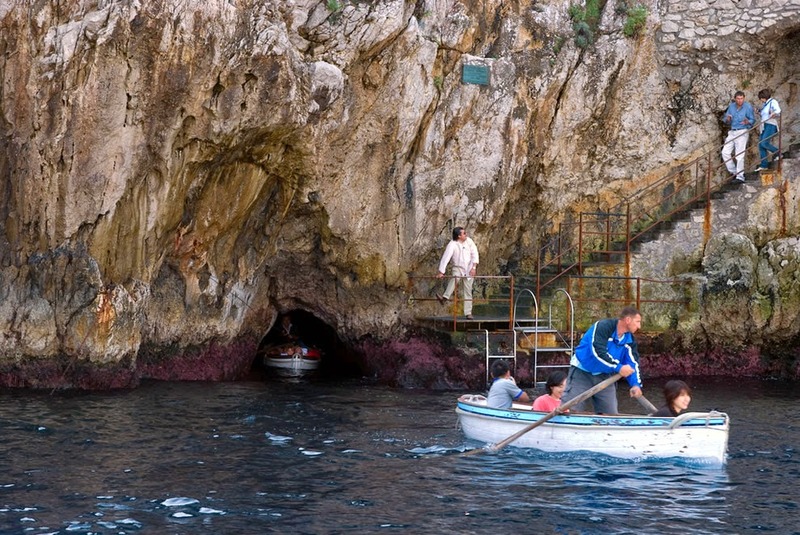 Although in May 1949 Princess Margaret visited Blue Grotto. 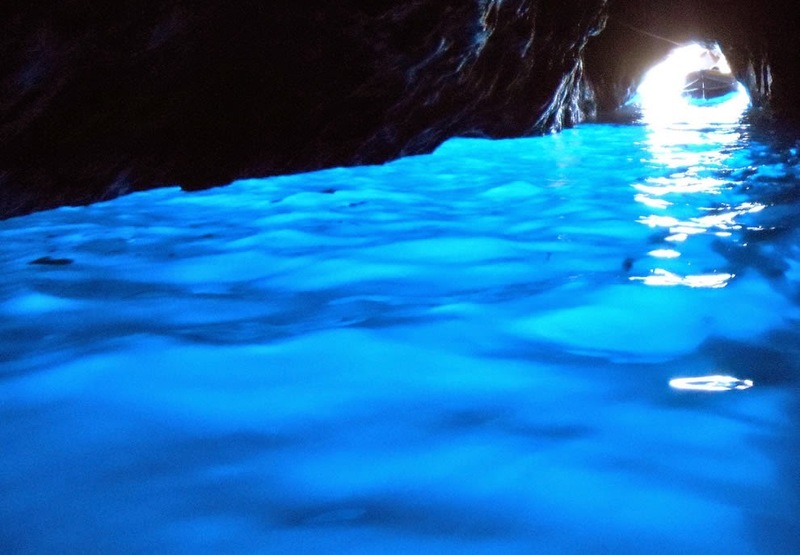 Once upon a time, Roman Emperor Tiberius used this lovely Blue Grotto, a sea cave, as his personal swimming pool. 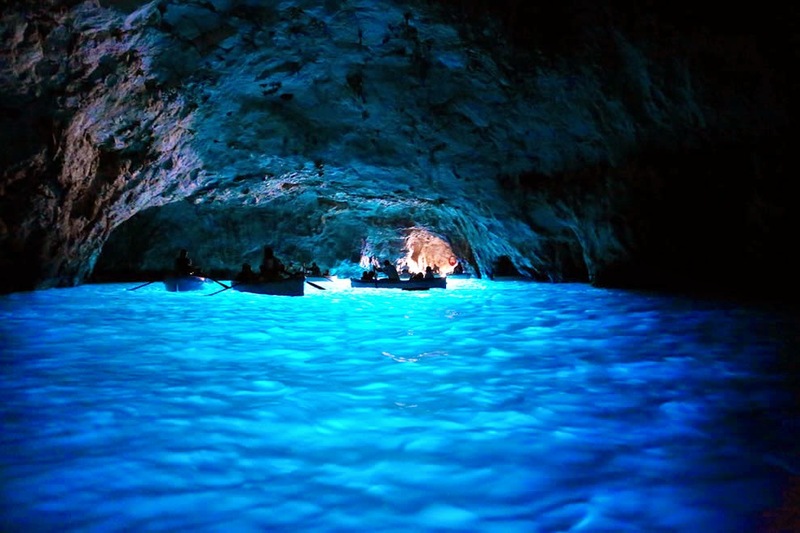 He loved the Blue Grotto so much that it was his favorite “nymphaeum”. 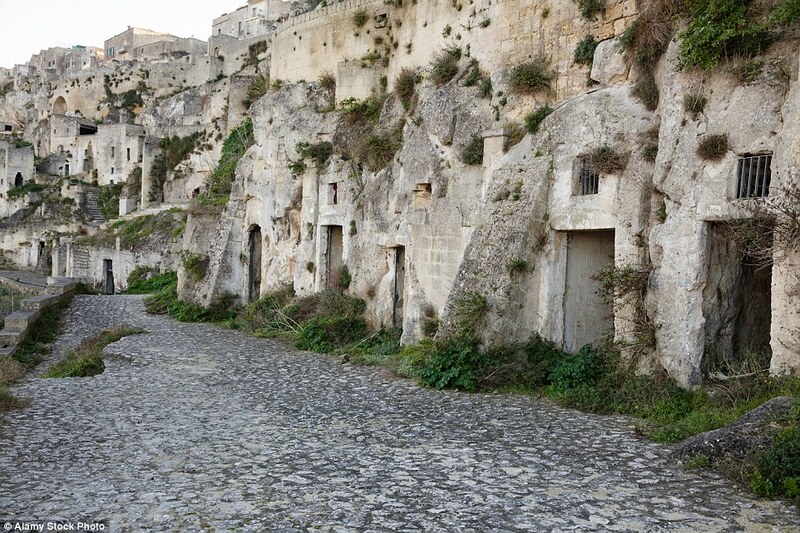 The grotto was recognized to the locals under the name of “Gradola”, was abandoned and feared by local sailors because of legends of spirits and demons which populated the cave. But it was avoided because due to be inhabited by witches and monsters. 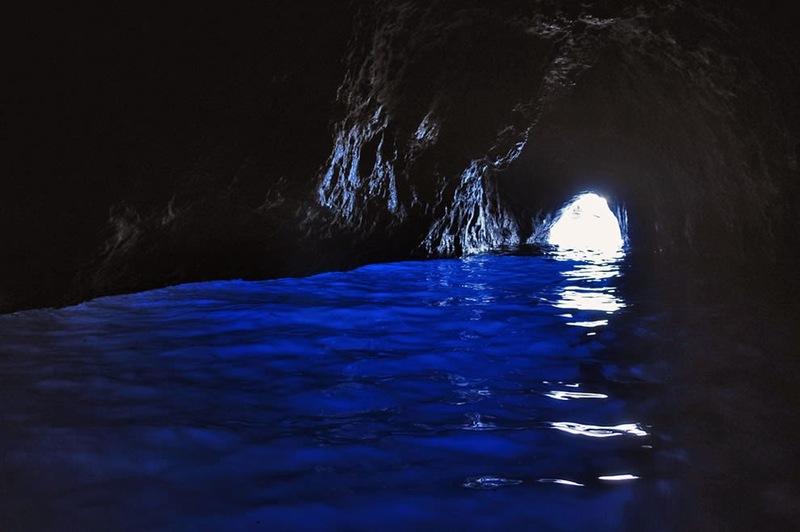 As the time passes, the Blue Grotto became a popular tourist destination in the 1830s, after the visit of German writer “August Kopisch” and his friend Ernst Fries to the cave in 1826 and after the issuing of the book of “Kopisch Entdeckung der blauen Grotte auf der Insel Capri” in 1838. 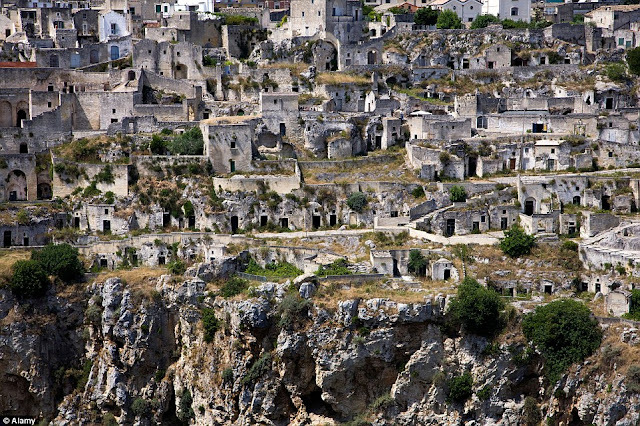 They were directed to the cave by a local fisherman “Angelo Ferraro” and during their journey, they’ve noticed the presence of Roman structures in the cave. 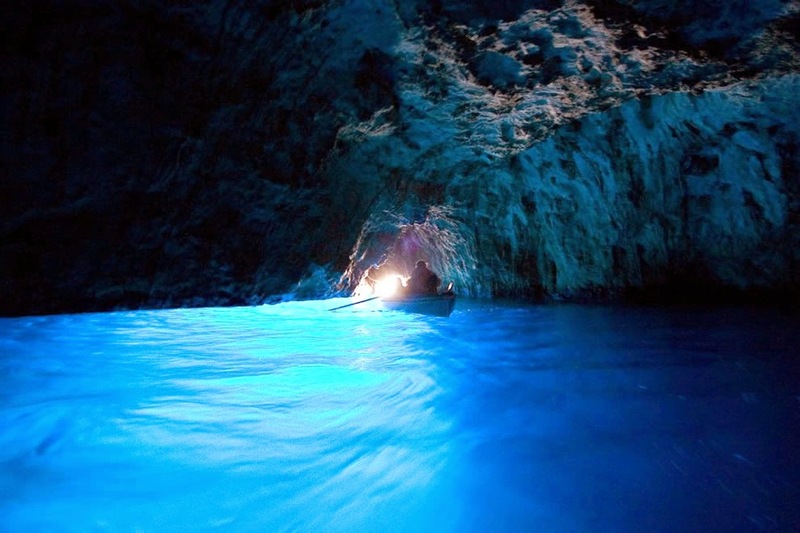 Since then the Blue Grotto has become the emblem of the island of Capri. 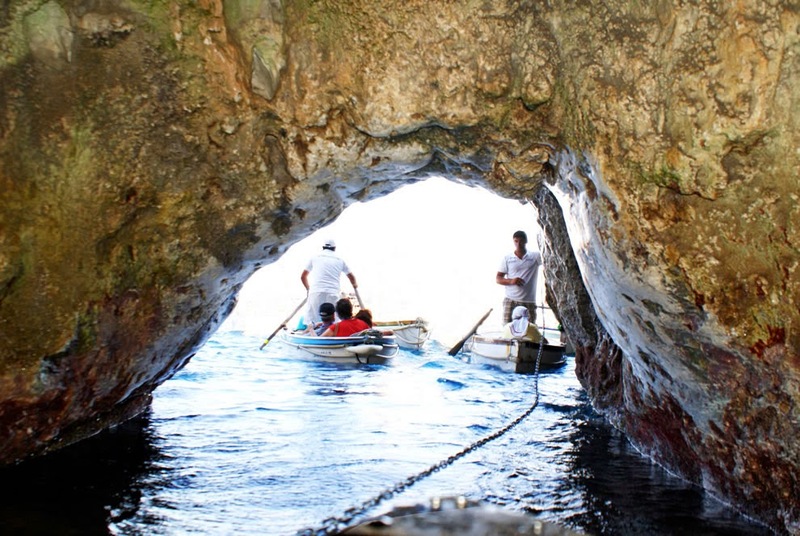 Moreover entrance to Blue Grotto on a day when the water is perfectly calm enough, the visitors are allowed to go inside. 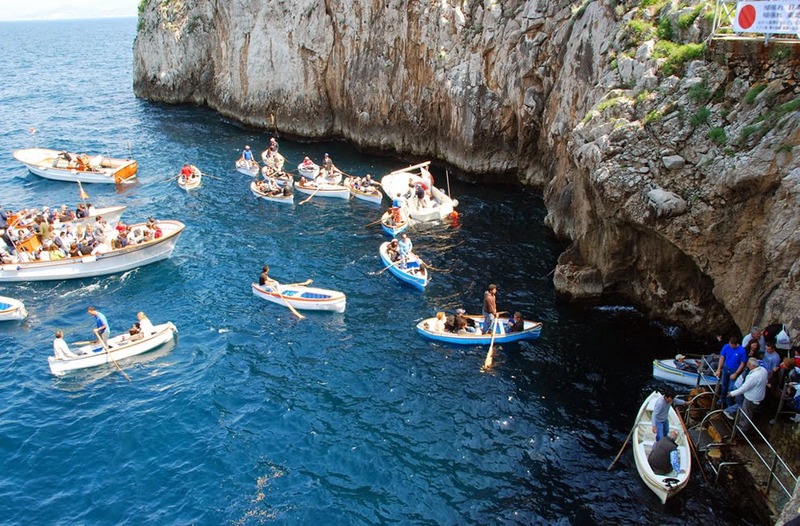 The Blue Grotto is one of those places, where at peaks times the queue of tour boats and those arriving by land can be one to two hours long, even though the total time stays in the cave is only a few minutes. 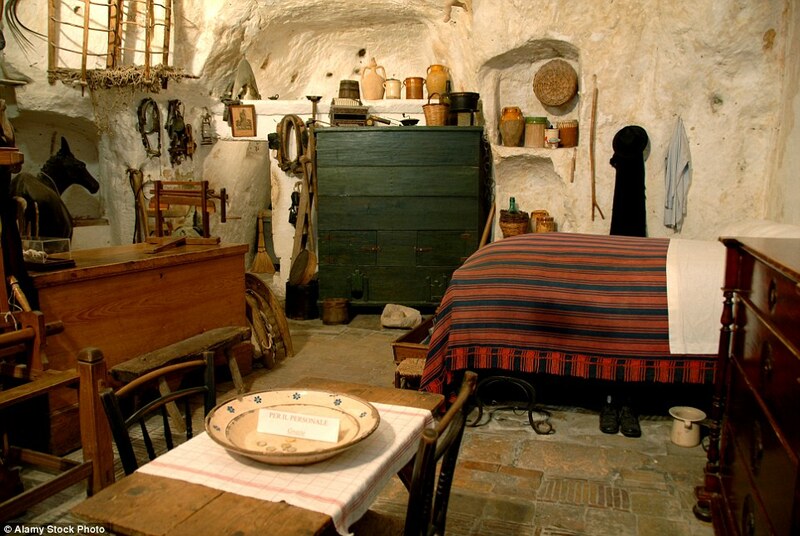 Many visitors are wondering what all the fuss is about? 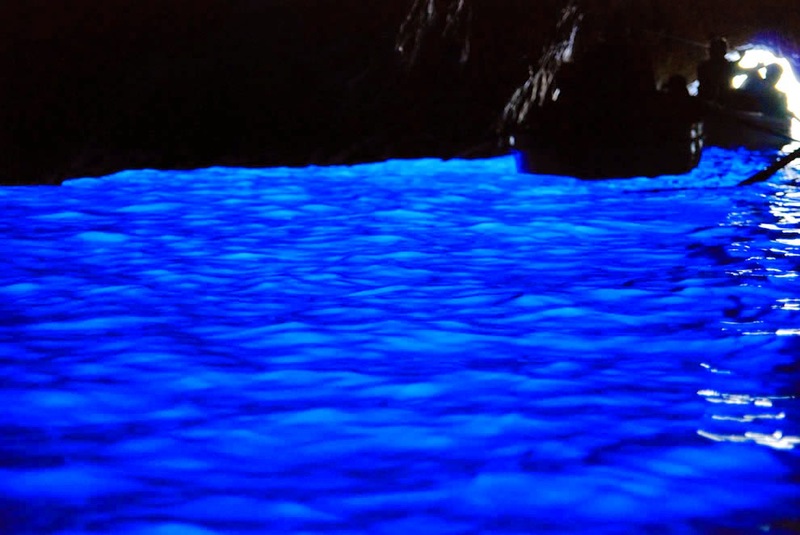 it’s a cave with a small pool of blue water and will begrudge the cost and time involved in seeing it. While the others are adore the place. Despite of all facts, it’s must see place if you’re going to Italy.